My new girl, Planetdoll Mini Riz, who is now named Roze! I just got my little Roze back from Leah the other day before I left for an overnight girl night for a doll show. I thought you all might like to see this cutie. She is SO pretty - just love her! She's a gorgeous sculpt and Leah did a beautiful job on her faceup. 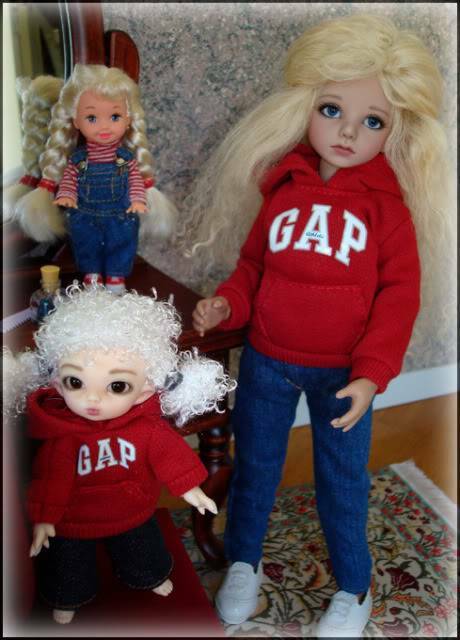 The cute outfits are a find I got at the doll show - a great bargain and so cute!! It's a Barbie/Kelly GAP set. Re: My new girl, Planetdoll Mini Riz, who is now named Roze! Roze is beautiful, Vicki, especially in the short brown wig! Leah certainly did a wonderful job on her face-up! @Connie - Sweet Creations wrote: Roze is beautiful, Vicki, especially in the short brown wig! Leah certainly did a wonderful job on her face-up! Thank you Connie! I ordered the mohair wig just for her but it seems like so much hair for her. I'm gonna see if I can tame it a bit. I agree, Leah did an awesome face-up, and I love her in the deep sea blue eyes!! Very nice!!! She is so adorable Vicki! I love Leah's face-ups and what a cute little outfit. I especially like her in the brown bob. Maya Grace is claiming her position as the only one in this size, strange little elf.. Thanks so much ladies! I agree that Leah captured Roze's look perfectly! Gracie- I like her best in the brown bob too. I ordered the mohair wig just for her but it has so much hair. I'm going to have to play with it and see what I can do. Kristin - I can understand your little Maya Grace wanting to be the only one that size. She wants to be special! Oooh, she's gorgeous! I just love her--and I think I need her, too. (Ugh--my wishlist is just out of control. I wish I could just turn off all the photo here, so I wouldn't be tempted, for crying out loud.) She looks fantastic--like she's real. Beautiful! And fantastic photos, I have to say! Very nice job! @Alison wrote: Oooh, she's gorgeous! I just love her--and I think I need her, too. (Ugh--my wishlist is just out of control. I wish I could just turn off all the photo here, so I wouldn't be tempted, for crying out loud.) She looks fantastic--like she's real. Beautiful! And fantastic photos, I have to say! Very nice job! Thank you Alison! Her realistic look is due partially to her coloring and her eyes, but Leah really puts her over the top as far as looking real. She's a fun size for me too! The more I see people's Planet dolls, the more I like/want them. Yours has a gorgeous face-up! @Minuet wrote: The more I see people's Planet dolls, the more I like/want them. Yours has a gorgeous face-up! Thank you Mae! She's a really nice doll for the price! He he! Yeah I know you do. She'd make a great friend for Sage and March! @luv*it wrote: yeah she would! Well I bought mine on their website! Sounds like a good plan to me! I think I'm settled in for now unless someone wants to buy my Lati Yellow Coco so I can get a Puki Fee. She has the renewal body with magnetic hands and feet.